– Bordo can only be reached on foot. Start at the luggage cable car and walk up towards the houses of Rivera. In Rivera you will see the little church on your left after about 200m. The trail begins to the right of the church. It takes about 25 minutes and 200 meters in altitude. Bring good shoes and a flashlight in the evening! As an alternative in bad weather you can also take the slightly longer way up the asphalt road to Cheggio and from there walk over the bridge to Bordo. – We strongly recommend you plan your journey in a way that you will arrive at Bordo when there is still daylight. – If possible please plan to arrive between 10:00 and 18:00. Your room will be ready in the afternoon. If you would like lunch on the day of arrival, please let us know in advance. – Arrival after dusk: If you arrive in the dark due to unpredictable traffic jams etc., please park below and walk up only with the things necessary for the night (the flashlight is indispensable here). Your room is listed in front of the dining room. The next morning we can pull up your luggage. – There is a luggage cable car (see map). You can load and attach your own luggage. During the day, it will be pulled up when you arrive in Bordo. No liability is assumed for valuables. Please use your discretion when transporting valuables by cable car. – Operation only in daylight. From dusk onwards, the luggage cable car can only be operated in exceptional cases. Note: You cannot see from above if someone is loading the cable car so it is possible that the cable car will be pulled up unexpectedly. Never stand between the wall on the mountain side and the cable car! – Parking facilities are limited. These are marked on the map. Please respect that it is not possible to park in the church square of Rivera or in the parking spaces near Cheggio. We recommend using public transport to protect the environment and the limited parking spaces. To take a taxi from the train station in Domodossola to the Osteria Mezzavalle or cable car station in Rivera costs about 30-35 euros. 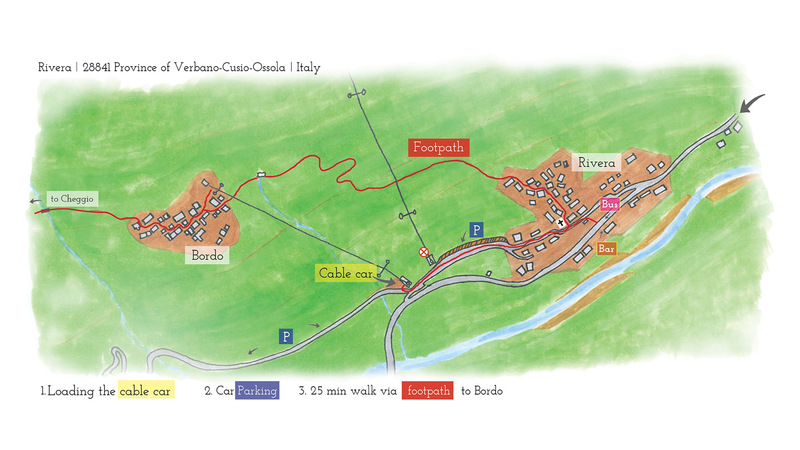 In Italian, the destination is: “Teleferica di Bordo, Rivera, Comune di Viganella, Valle Antrona”. Sometimes the taxis also drive up to the small parking lot near Cheggio for an additional fee. However, because it is often overcrowded and difficult to turn around, you cannot rely on this. From Domodossola there is a bus to Macugnaga at 6.20 pm; in Villadossola change to the bus to Antrona at 6.35 pm. Coming from Antrona, the bus connects Villadossola to Domodossola after 18:00 with a bus coming from Omegna. On Sundays and holidays there is no connection to Rivera. Note: To understand the timetable, it is good to know that it is geared towards schoolchildren and employees. Saturday is a school day and working day, unless a holiday falls on a Saturday. The service is only available with a reservation. Reservations must be made by 12 noon on the working day (monday-friday) prior to the desired day of travel at +39 0324 240 333 or online at http://www.comazzibus.com/eng/prenotazione_alibus.php. The price for the route Domodossola <-> Malpensa is 15,00 €.